Italian Greyhounds need good exercise. Most of the books on Italian Greyhounds state that the breed needs light exercise. We disagree! 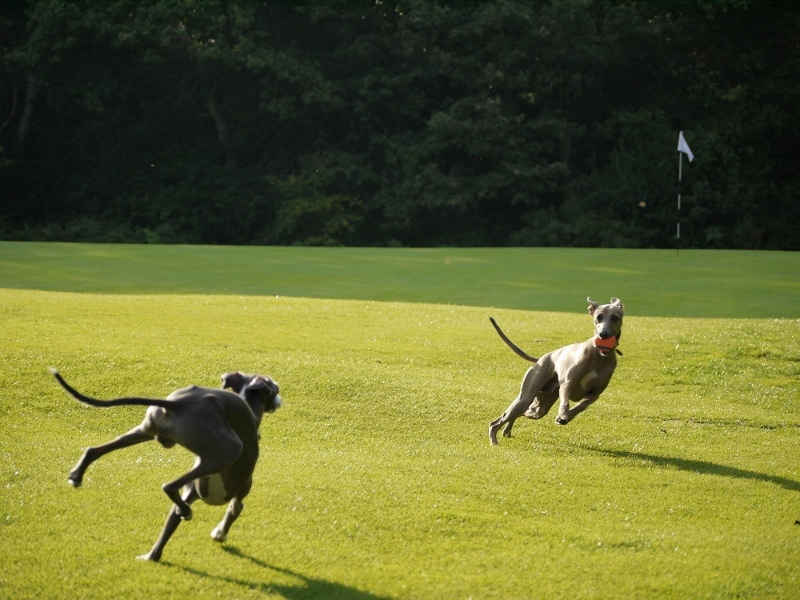 They are high energy dogs and unlike their larger Greyhound cousins they also have stamina and need to burn off some of their endless reserves of energy! Italian Greyhounds should be allowed to free-run when it’s safe to do so – their high energy levels means they can keep going for hours! Ideally Italian Greyhounds should have at least one walk every day for at least an hour, and if safe to do so your dog should be allowed to walk off-lead and run free – you need to have trained your dog to come back when called before doing this. 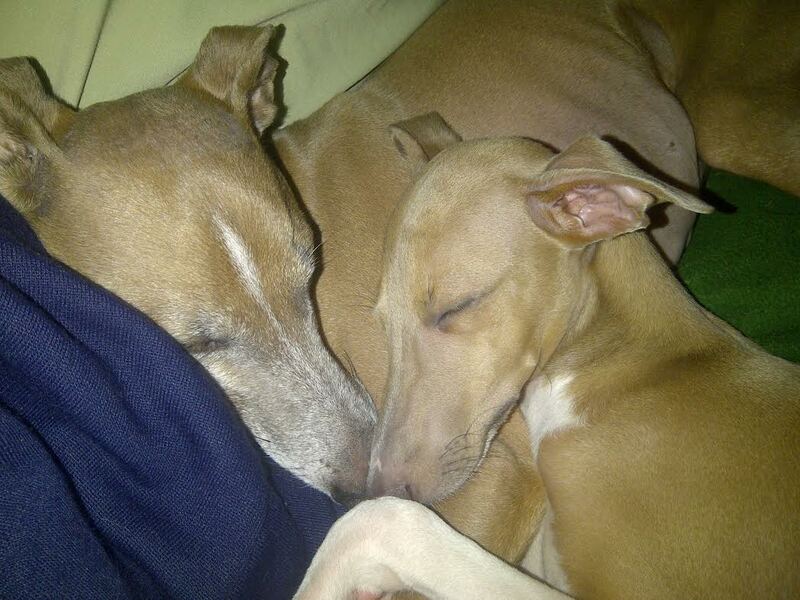 Do bear in mind that Italian Greyhounds are Sighthounds and if they see anything that looks even vaguely like it’s worth chasing they will do so and there are very few IG owners who can honestly claim that their Italian Greyhound would stop mid-chase on recall. Many an Italian Greyhound owner has let their dog off the lead to see it shooting off after a rabbit and then spent the next 30 minutes wondering if the Italian Greyhound is ever going to come back. Exercise is not just about physical exercise it’s also about psychological stimulation for your dog. Imagine being stuck within the same four walls every day, day after day – most of us would go stir crazy and dogs are no different. Sniffing new smells, seeing different things, hearing different sounds – this is all critical to ensuring that your dog is well-balanced and well-socialised. Treadmills are a novel and modern idea for exercising dogs but then you may as well have a hamster on a wheel. Dogs need to be walked in the great outdoors. When exercising your dog, make sure you do so responsibly. You should have full control over your dog – it should not be allowed to pester other people, dogs or other animals such as livestock in country fields. Fenton was funny on YouTube but less amusing for the owner at that point in time. Always carry poop bags to clean up after your dog. So stick to at least one walk a day, two if you can manage it, allow free-running if it is safe to do so, and watch out for rabbits and squirrels! It is a legal requirement in this country that all dogs must wear a collar with an identification device bearing the owner’s name and address (the minimum allowed for an address is post code plus house name or number) when in a public place. You will also need a suitable, well-fitting collar and a lead. Italian Greyhounds have long, sensitive necks and it’s a good idea to use a special Sighthound collar that is wider at the front than at the back so that the pressure from the collar is spread more evenly. Sighthound collars are also more secure than traditional slim collars – Italian Greyhound heads are relatively small and therefore they can slip out of the slim straight collars more easily. An alternative to a collar is a harness and there are several specialist makers of harnesses for Italian Greyhounds in the UK and online. 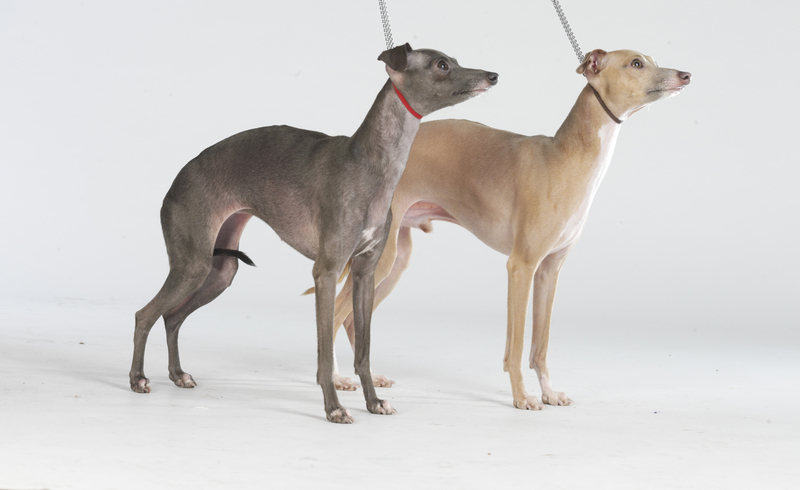 The Italian Greyhound body shape and proportions, as well as a very fine coat and sensitive skin, means that it’s very important that the harness fits the Italian Greyhound correctly. The standard nylon harnesses that you find in most major pet stores are not suitable as they more often than not will rub and chaffe the Italian Greyhound, sometimes causing painful ‘burns’, cut and blisters. Some people use extendable leads but many Italian Greyhound owners steer clear of them because of the injuries that can be sustained problems by dogs that can accelerate extremely quickly. If on a lead, they take off and when they reach the end of the line the backlash can be severe. And always carry poop bags to clean up after your dog.